A father and daughter take in France's opening game together. The European championships are being held across the country. As Muslims around the world observe the holy month of Ramadan, a tight-knit group of young Lebanese entrepreneurs has sought to combine the twin tenets of faith and football (soccer). Nestled on the Beirut coastline, a huge dome is the place to watch one of the world’s biggest sporting events on big television screens. And for those who have broken their fast, it is a place to indulge their passion on an epic scale. Welcome to Layali Beirut, where the trials and tribulations of the UEFA European Football Championships in France, play out amid the thick clouds of shisha smoke and post-fast communality. At 21 years old, Fawaz is among the older members of a seven-strong group that has grown up together, and that shows no lack of ambition in putting on events. Responsible for bringing a World Cup showcase to Beirut two years ago that played host to tens of thousands of Lebanese, their collective has once again returned to the fray. Inside the dimly-lit dome, a temporary shell previously used for a recent cultural festival, the beams of four projectors paint the walls in the lush greens and rapid action of live football. Projectors beam out the games onto the sides of the dome. High above the groups of people sitting at tables and on couches, the projected images of icons like Portugal’s Ronaldo loom larger than life as teams battle it out to make it past the group stage in the competition. Because of the time difference with France, which is hosting the competition, Lebanese who have already broken their day-long fast with a traditional meal at the setting of the sun, known as iftar, can order dishes suitable for suhoor, a meal during Ramadan that can be eaten either late night, or early morning before sunrise. And with alcohol off the menu, classic Ramadan drinks like jallab, made from the syrup of grape molasses, are offered. Rashad Hamieh, an avid fan of Germany's team, is from a large clan in Lebanon’s Bekaa region. The idea was to respond to the sense of community that is a key role in Ramadan, Fawaz explains, adding that they would be working with community organizations and charities, too. “Ramadan is a month to give back. One of the reasons to fast is to know that not every meal is guaranteed - it’s not just about making profits here,” he says. The spirit of Ramadan may run through Layali Beirut, but it is by no means only for those fasting. In a country with often deep political and religious differences, the organizers made an effort to welcome all, with the souk outside the dome offering food catering to many tastes. 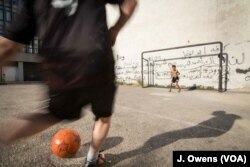 Youngsters play football on the streets of Beirut. Though many of the young entrepreneurs have been studying abroad, for 19-year-old Adnan Ammache it was important to put on the event in their home country. “Everyone feels united while watching the game. Fans are cheering for one team no matter what happens, and I guess sports gives us hope,” he says. The importance of such a sentiment became apparent that evening. While speaking to VOA and enjoying iftar at his family’s restaurant, news came through to Ammache that a bomb had exploded outside a bank in the Beirut district of Verdun, not far away. There were no reported injuries, and no group had claimed responsibility, but it was a reminder of the tensions that lurk not far from the surface in the country. After a number of security checks, the night goes ahead, but only a quarter of those who show up have booked tables. Though careful to take such threats seriously, the Layali Beirut entrepreneurs said they will not be put off by acts of violence — they’ve been through this before. Though the dome has been set up with Ramadan in mind, the organizers emphasis that all are welcome. When a bomb went off during the World Cup gatherings they were hosting, people stayed away for a few days but soon returned to enjoy the football. For Fawaz, at least, keeping the dome open in such times is about more than just offering a place to watch the football, or a place to relax during Ramadan. “We will not be scared by what these terrorists are trying to do,” he added.